November is Peanut Butter Lover’s Month, so let’s find out everything we need to know about jelly’s best friend. 1. There is some debate over who invented peanut butter, but the first American patent for the lunchbox staple went to John Harvey Kellogg in 1895. Canadian Marcellus Gilmore Edson had patented a proto-peanut paste the year before, which doesn’t sound like it’d be quite as tasty when spread on celery. 2. More than half of the American peanut crop is used to make peanut butter, and that’s a lot of peanuts. America is the world’s third-highest peanut-producing nation, after China and India. 3. It takes about 540 peanuts to make a 12-ounce jar of peanut butter. 4. Peanut butter sales were confined to regional markets until the development of hydrogenation in the 1920s. Hydrogenation stops the separation of peanut oil and solids by raising the melting point so that peanut butter is a solid at room temperature. Hydrogenated peanut butter outsold natural for the first time in 1942. 5. Arachibutyrophobia is the fear of getting peanut butter stuck to the top of your mouth. 6. There are plenty of all-natural peanut butters to choose from these days, but no matter what brand you pick up, rest assured that most of what you’re getting is peanut. In fact, law dictates that any product labeled “peanut butter” in the United States must be at least 90 percent peanut. 7. 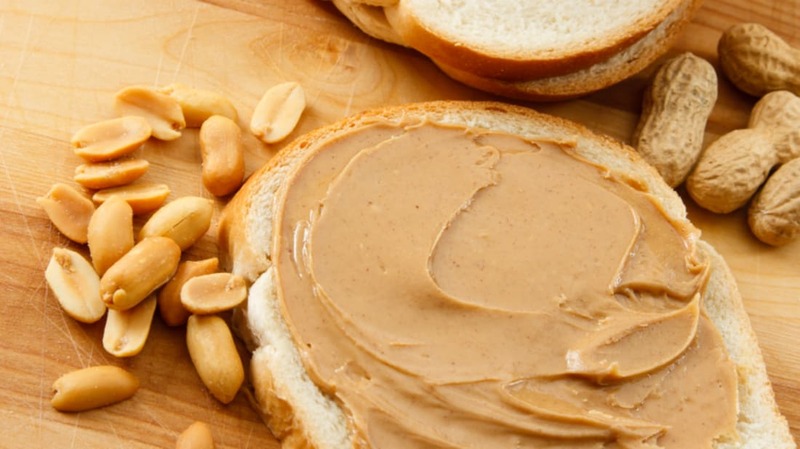 In the ongoing battle of crunchy versus smooth, sales records show some demographic breakdowns: People living on the East Coast prefer creamy peanut butter, while those on the West Coast prefer the crunchy style. Additionally, women and children prefer creamy, while most men opt for chunky. 8. Even after accounting for those preferences, 80 percent of the peanut butter sold in the U.S. is creamy, while only 17 percent is crunchy. The remainder is a mixed variety where peanut butter and jelly are together in the same jar. 9. Peanut butter is more than just delicious and filling—it may also have long-term health benefits. One recent study showed that girls between the ages of 9 and 15 who regularly ate peanut butter were 39 percent less likely to develop benign breast disease by age 30. 10. Peanut butter is also loaded with potassium, which is shown to help counteract the effects of a high-sodium diet by relaxing the blood vessels. This is especially helpful when you consider that there’s a vocal group of foodies touting the deliciousness of pairing peanut butter with bacon. 11. Animal trainers for movies and TV have achieved a “talking horse” effect by feeding their equine actors sticky peanut butter and letting them flap their jaws. 12. Peanuts, it seems, are very presidential. Thomas Jefferson dabbled in peanut farming before becoming president. 13. Peanut butter and jelly sandwiches are considered the all-American school lunch food, but when it comes to pure peanut butter, Canadians and the Dutch actually consume more per capita than Americans do. 14. The peanuts in your peanut butter today are a different variety than the ones used 50 years ago. In the 1960s, peanut butter was made with a combination of Spanish peanuts (which have a sweet taste because of their high oil content and are used as cocktail peanuts) and Virginia peanuts (whose low oil content balances out the Spanish), whereas nowadays the prolific and less expensive runner peanuts are used. 15. Grand Saline, Texas, holds the record for the largest peanut butter and jelly sandwich, which weighed in at 1,342 pounds.